Alessandra Ferri is internationally considered one of the most important dramatic ballerinas of our times. Winner of the most prestigious international prizes, Alessandra Ferri was a principal dancer with the Royal Ballet from 1983 to 1985, then with ABT from 1985 to 2007 and with Teatro alla Scala from 1992 to 2007. Alessandra Ferri was born in Milan and began he studies at the school of the Teatro alla Scala. Subsequently she studied at the Royal Ballet School in London. In 1980 she won the Swiss Prix de Lau sanne and was admitted to the Royal Ballet. She gained fame in 1983 when Kenneth McMillan se lected the 19-year old dancer for the main roles in his ballets, Romeo and Juliet, Manon, and Mayerling. Miss Ferri received the prestigious Sir Lawrence Olivier Award. The magazine Dance and Dancers and the New York Times named her ballerina of the year in 1983. In 1985, Michail Baryshnikov invited her to join American Ballet Theatre (ABT) to participate in a world tour. With Mr. Baryshnikov she danced in the 1986 f lm version of Giselle. At ABT she per formed the main female roles in Romeo and Juli et, Giselle, Manon, Don Quixote, La Bayadere, Nutcracker, La Sonnambula, Swan Lake, Merry Widow, and many others. Since 1990 Alessandra Ferri has been traveling the world as international ballet star making guest appearances. In 1992 she was invited to Paris by Roland Petit to dance in his version of Carmen at the Paris Opera. Miss Ferri also danced in other Roland Petit ballets. Since 1992 she has been prima ballerina at the Milan Teatro alla Scala. She dances in Buenos Aires, in Rome, in Naples, London, New York, Toronto, Marseille, Sydney, Berlin, Hamburg, Amsterdam, Paris, Moskau, St-Petersbourg, Tokio, Os aka, Athen, Lausanne, Seoul, Monaco, Rom und Stuttgart. 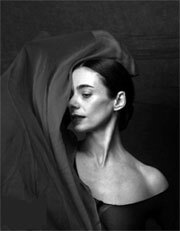 In 2000 Alessandra Ferri was awarded the Benois de la Danse Prize. She retired from the stage in the summer of 2007.